Every summer it seems inevitable that bushfires will leave thousands of hectares of the Australian landscape barren and charred and seemingly devoid of life. 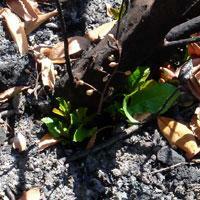 For weeks afterwards there are no significant signs of life, just blackened ground and charcoal-covered tree trunks. As several weeks pass and hopefully with some soaking rains, the landscape begins to change dramatically. The ground develops a green tinge as the grass protrudes through the blackened soil and debris. Fresh green shoots flourish on trees seemingly dead. The native fauna start to re-populate the area. As the weeks pass, the bush continues to rejuvenate rapidly. With time, normalcy is restored, although it will take years to regenerate and grow to its pre-fire condition. Witnessing these changes occurring in the environment reminds me that they are very similar to changes that occur in people’s bodies as their nervous system function is improved with adjustments to correct their vertebral subluxations. Years or even decades without a proper nerve supply due to subluxations has major detrimental affects on body function. Gradually cell, tissue and organ function deteriorates. Importantly, it is often many years before this decreased function manifests as a sign or symptom. When a person begins receiving adjustments and their nervous system function gradually improves, their body begins returning to normal. Sometimes people notice improvements in their health and well-being immediately, but the regeneration and healing takes time, as it does in the bush after a fire. Initially, changes occur at a cellular level that will often not be noticeable, but as they accumulate and start to affect tissue and organ function, most people will become aware of the positive changes that are taking place in their bodies as the healing progresses. It is important to realise that whether you are aware of it or not, health-restoring change is still happening, even if the changes going on in your body may not be as obvious as those in fire ravaged bushland. Also, just in the same way that the bush can never be exactly as it was before the fire, your body can never be as healthy as it was before all the years of trying to function with an impaired nervous system. Some damage can be permanent, depending on how long it has been present. But experience has taught me never to underestimate body’s ability to heal and restore itself, given the right circumstances, and enough time.